numéro du 29 juillet 1911"
via email from Dave Lam, 8-17-04 Denise Moore's real name was Jane Wright. Her background is unclear, but she was probably born in Algiers, Algeria to English parents. Her parents did not approve of her learning to fly, so she did so under a pseudonym. Reportedly, she chose the name Denise because it was the feminine version of the name of her dead husband. She began to take lessons at the Farman school at Chalons in June 1911. She crashed and died at Mourmelon/Etampes (France)-- on 21 July 1911 in a Farman. She never earned her license. At the time of her death, she was 35 years old. ONLINE RESOURCES - PRIMARY I was alerted to this very fine website by its author, Bernard Gineste and by Dave Lam. numéro du 29 juillet 1911 Those of you who can read this article in French are in for a real treat. It is a most comprehensive and interesting account of her life, career and death I have ever found. Even in the machine-translated version, it is absolutely enthralling. In addition to the story itself, the page offers numerous photos, a bibliography and links to other site. You can access the page by clicking on the title above. If you don't read French, I heartily recommend that you copy the URL, paste it into the BabelFish machine-translation program, and take advantage of the wealth of information which is available. 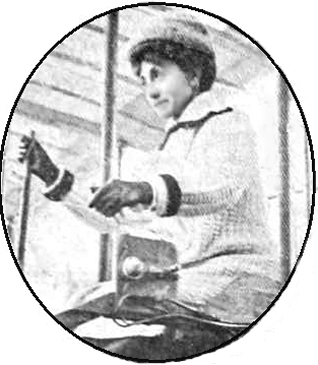 "21 July 1911 - Whilst on a solo flight in a Farman, Denise Moore becomes the first woman to be killed in an aeroplane when she crashes at Chalons in France. " She crashed and died at Mourmelon/Etampes (France)-- on 21 July 1911 in a Farman.